We’re running a deal that’s sweeter than ever on this townhome for rent in Destin, Florida! Take 50% off your application fees if you apply and then move in by December 25th. That’s right; half off! The rate was also just reduced to $1,600/month. We never do this, so don’t wait much longer to call 403 Twin Lakes Lane home! Visit here to learn more. 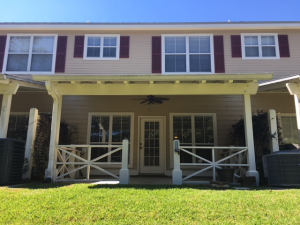 We think you’ll love this 3BR/2.5BA townhome, located right in the heart of Destin off Twin Lakes Lane and near the Destin airport. The location doesn’t get much better, as you’ll find you’re just minutes away from an array of shopping, dining, and of course – the beaches! Families with young children will love this home, as it’s just a four-minute drive away from Destin Elementary School and 11 minutes away from Destin Middle School. You truly could not ask for a better location! Inside, you’ll find sleek hardwood and tile floors, large windows, and stylish black appliances. Take the stairs up to the second floor for the bedrooms. In each bedroom, you’ll find plush, well-maintained carpeting. Our favorite room is the master bedroom: it’s spacious enough to accommodate a king-size bedroom set and all your favorite pieces! You’ll find plenty of space as well in the walk-in closet. Double vanities set in granite countertops can be found in the master bedroom. Also upstairs, you’ll find a conveniently placed washer and dryer. Need to relax after a long day? Stretch out on the large back deck and soak up some sunshine. As an added bonus, this rental is pet-friendly! 403 Twin Lakes comes unfurnished, allowing you to add your own personal touch. Are you ready to call 403 Twin Lakes Lane home? Give us a call today to find out how we can turn this dream into a reality!